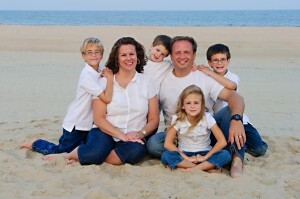 In the summer of 2000 my wife and I graduated from seminary and went to work for a church plant in Maryland. She was over the children’s department and I served as the associate pastor (which is basically over everything else). Because of several circumstances and other’s personality idiosyncrasies I found myself leading the children’s ministry with my wife’s help. But let me backup. Before my wife and I moved to MD, we lived in Raleigh, North Carolina. We loved our home church and served as volunteers in the children’s department. This willingness to serve was rooted in both of our desire to have children. After two miscarriages and much heartache we found ourselves in a new place of ministry. This place of ministry dealt mainly with children. We could fool those around us (especially on Sunday mornings), but our hearts desire was to have children of our own. Four long years went by and many doctor’s visits. Kimberly ended up have many painful procedures, tests, and eventual surgery that corrected our problem. Soon we found ourselves expecting twins. It is hard to express in writing, or even spoken word, how we felt when we saw the two boys, and heard their heartbeats on the sonogram. We both held our emotions because there was no promise that the pregnancy would make it all the way to delivery. As the months went by there was a baby shower, I assembled cribs, and we found ourselves driving around in a minivan. Two years passed and a little girl came along, and then a couple of years later another boy. Fourteen years later we are still driving around in that same minivan, but praise the Lord the van is full. There are many times when I smile when I see that van. In our church in Maryland, I moved from serving as the associate pastor to the senior pastor. The church was small enough that I could preach, and still have a strong say in the direction of the children’s ministry. I continued my education and found that my doctorate focused heavily on children and how the church and family needed to work together. In 2010, the church where we had served for over a decade went through a major change, and I knew it was time for my family to move on to another place of ministry. What does it mean to be successful? (I was voted “Most Likely to Succeed” in high school and it weighs like a millstone sometimes). Whatever this next move may be will more than likely determine if I “move up”, in ministry or slide into decline. I can not tell you how many people asked me, “Why would you go from serving as a senior pastor to a children’s pastor?” As if it were a step down, and I understand in many people’s mind it is. How will this move affect my family? Most families in ministry deal with this question “If our kids move to another state and have to start their lives over (new school, new friends, new church, new teachers, etc.) I knew this would be hardest on them. My kids were doing very well, was I going to mess that up? There was also a significant change in pay so would we make it financially? Do I accept a place of ministry because it will help us get ahead financially even if I know I am not called to go there? Am I clearly hearing from the Lord? At the end of the day I am a depraved sinner, and sometimes doubt. I doubt I am making the right decision. I doubt I have what it takes to be “successful” (whatever that is). I doubt that I will ever make a difference for the Lord. At the end of the day if I can know that I am following the Lord, nothing else matters because He will take care of the details. His will comes first, but what if I don’t hear Him clearly? During the process of searching for the Lord’s will three separate churches approached me. One was about the same size as the one I was serving in, and I knew right away that I could not help them. Believe it or not pastoring in a smaller church is ten times harder than serving in a larger church. You wear multiple hats, work 24 hours a day, seven days a week, and stay tired all the time. At this point in the journey I was burned out, exhausted, and needing a change. So a parallel move in ministry wasn’t going to work. The second and third were very similar, they were larger churches, who had been through tough times and were ready to follow a leader. Both brought me in, gave me the tour, fed me steak, and both offered me the senior pastorate. I declined. Both would require me to pour out my heart in the pulpit, but would take me away from my kids. I would not even see them on Sunday mornings. One of these churches was by the beach (I love the beach), and I took an afternoon to sit on the sand, and do some soul searching. I have always been the front person of most of what my kid’s do. Serving in a smaller church allowed me significant freedom to be involved in my children’s lives. I led their Cub Scout dens (every year), led the children’s ministry in their church, I was the entertainer at their birthday parties, and if there was a field trip I was there (if I could be, or made the costumes for the plays). So as a I sat on the beach I knew I would not be happy serving as senior pastor right then. But it wasn’t until I read a facebook post by a friend (Brandy Moates) some time ago that helped me to formulate into clear wording why I am Children’s Pastor. “Being a parent and “mommy” is a tremendous blessing, a huge responsibility and without a doubt the hardest and most demanding, yet rewarding job ever. Blessed beyond measure and filled with intense feelings of thankfulness and disbelief that these most precious and beautiful gifts are our daughters. Yes…I am that mom…there have been times when I find myself explaining why I don’t leave my children overnight for a break, get away for a weekend or even an extended vacation. You see, to ME being a mom means putting my needs aside even when I feel like putting myself first or even when I feel like I need “me” time. Don’t get me wrong, there are plenty of days when I want to lock myself in a quiet room and just read or sleep or go shopping without a tag along, or even be able to eat an entire meal without being interrupted. In those moments of frustration, I try to remember that this is a season. A season that will pass all too quickly, a season that for the most part, will be longed for when it is gone. When I read her post, I was suddenly reminded of those months way back in seminary when I would hold my wife as she wept, or hear her crying into her pillow. I remembered how the Lord has been faithful to give us four wonderful children and how immense this responsibility and privilege remains to be. My love for them is unspeakable, indescribable, and touches me deeper than any thing else has in my life. My heart ached when Joshua and Caleb stepped onto the school bus for pre-K (even though it was across the neighborhood, and it was only half-a-day). Every year of growth and change is bitter sweat. The twins have just transitioned into youth ministry, my daughter is going into fifth grade, and my youngest son is going into second grade this year. I still have them for a season. There may be days ahead when I can fill the pulpit again, but for now I am a Children’s Pastor because I can lead my children toward the Lord, and I recognize that it is only for a short season. The church we ended up accepting the call to ministry was in Valdosta, Georgia. God has blessed me with a church that values ministry to children enough that they provide a staff position to lead that area. We are seeing significant growth, changed lives, and changed families. At the root of it all is the love of a father for his children. I am thankful for a Father who loves His children. I know that there are many couples who have gone much longer than four years, many their entire marriage, so please know that I recognize their pain and that four years may not sound very long. For us, it was a monthly roller coaster of emotion. Expectation was followed by hope, then joy, then doubt, and then the pain of knowing that you are not pregnant this month. Up and down, up and down, month after month.